Are any of these 2016 debuts ones you’re looking forward to as well? Blog Tour: Still the One by Jill Shalvis – Excerpt + Giveaway! I’m also excited for THE LOVE THAT SPLIT THE WORLD and THE CROWN’S GAME. You have a great list today, Jess! Thanks for sharing. A Study in Charlotte also made my list. I see a lot of beautiful covers in your selections. Hope you get a chance to read all of them next year. We have some in common this week Jess! It looks like there will be a lot of amazing debuts next year! The Crown’s Game must be highly anticipated. I’ve seen it on a lot of lists. Oh nice! Lots of Into the Dim going around! Most using the older, prettier cover! Sigh…wish they would’ve kept that one! I HAVE MORE THAN A FEW IN COMMON. I think that means we have some really great taste in books. I am so so so desperate for The Crown’s Game lol. I really need to check out a few of these, I’ve seen them on so many posts today! Especially Rebel of The Sands and A Study in Charlotte! I’m seriously excited about Rebel of the Sands. I know I should be careful of the hype, but I can’t help it. Sworn and Verse and Assassin’s heart are on my list. I also see a few good ones here that I might add them to my wish list. PS: your site is too cute! Looks like After The Woods, is going to be a good one! I forgot to add The Serpent King to my list! I’ve heard such great things on Twitter about it! Nice list this week. A Study in Charlotte and The Love that Split the World are on my list this week too. After the Woods looks good as well . Great list! Assassin’s Heart is one I’m really excited about. The combination of assassin families and the deception seems to be the makings of a great story. I’ve not heard of These Vicious Masks but after reading the synopsis and having it described as Jane Austen meeting the X Men I’m definitely going to be keeping my eye on it. Lovely choices!! 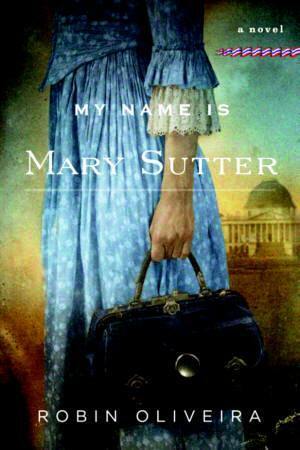 I read A Study in Charlotte, and it was wonderful. I can’t wait to read Rebel, These Vicious Masks, The Serpent King, and Into the Dim. Also excited for Caraval, Please Don’t Tell, Ever the Hunted. The Marked Girl, Mirror in the Sky, and Thief of Lies. Amazing list! I have quite a few of them on my to-buy list, and can’t wait to pre-order them. Hopefully, the wait won’t seem too long :) I’m lucky enough to have a copy of Sword and Verse waiting to read, and I’m hoping to read it this week! Rebel of the sands has such a fantastic cover. I’ve heard amazing things about A study in Charlotte. 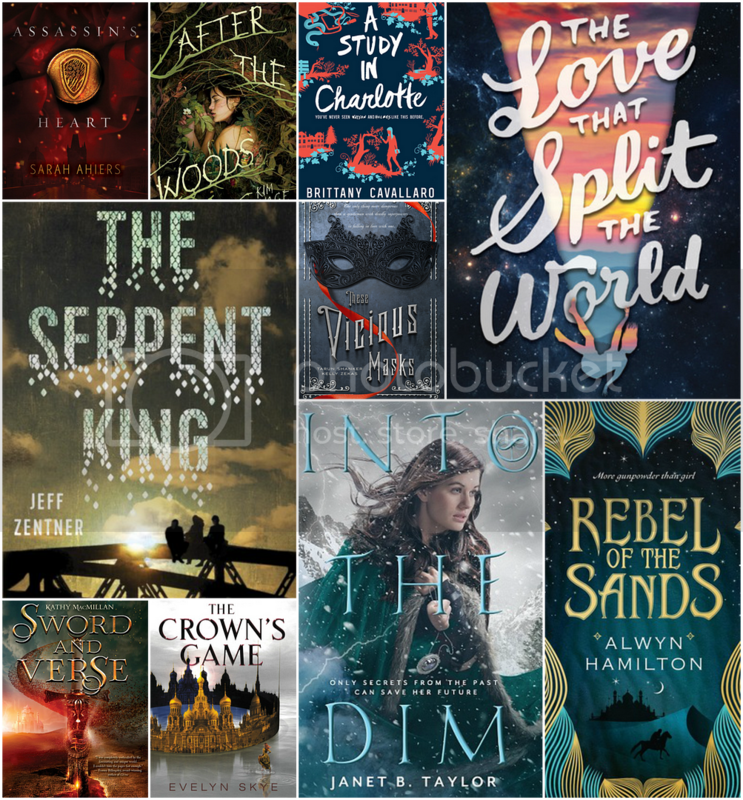 There are so many amazing debuts coming out in 2016! A ton of these are on my list too. I’m probably most looking forward to A Study In Charlotte. I am so glad I didn’t do a TTT this topic because I would’ve had to edit it and add all the book you thought of that I forgot. Like… The Love that Split the World. That book…. I’m on my computer so I can’t do it but imagine the heart eyes emoji right here –>. I think I am the most excited for The Crown’s Game. I love the premise of it soooo much and will probably preorder it waaay too early. But it’s one of those books I have to own. Well TCG and Rebel of the Sands! That book is another I will be preordering a hardcover of! I am so glad the changed the US cover. I was willing to use Book Depository to get the UK cover but now we don’t have toooo! I can only hope the book is as good as the cover looks! Vicious Masks and After the Woods are two I also have my eye on! I was lucky to get ARCs of both and I will probably cheat on my reading schedule with TVM here soon. That cover and synopsis….